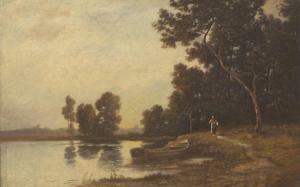 Find artworks, auction results, sale prices and pictures of Léon Richet at auctions worldwide. LEON RICHET (FRENCH 1847-1907) Boisiere dans la Clairiere de Barbizon, oil on panel 40.9 x 56.5 cm (16 1/8 x 22 1/4 in.) 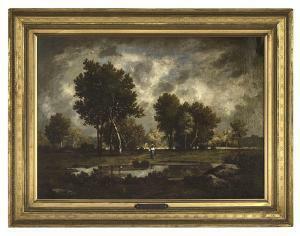 signed lower right LOT NOTES The work of Leon Richet was greatly influenced by that of his teacher Narcisse Virgile Diaz de la Pena, a leading artists of the Barbizon School. As his teacher, Richet found himself painting at Fontainebleau and Barbizon  areas, treasured for their pristine beauty by the landscape painters of their prior generation. It is in this area that Richet would create his best known works, for which he is remembered as one of Diaz's most successful students. RICHET, LÉON (Solesmes 1847 - 1907 Paris/Fontainebleau) River landscape with rowing boat. Oil on canvas. Signed lower right: Léon - Richet. 32.5 x 52 cm. Provenance: Private collection, Germany. Koller, Zürich, 19.9.2014, Lot 3221. Swiss private collection. Our thanks to Michel Rodrigue who has confirmed the authenticity of this work on the basis of a photograph. Sale 1802 Lot 67 Leon Richet (French, 1847-1907) "Paysanne au bord de l'Etang pres de Fontainbleau", 1881 oil on canvas signed and dated lower right, stretcher with "C. F. Adams, South Lincoln, Mass." inventory label. Framed. 29-1/4" x 39-1/2", framed 36-1/2" x 48" Provenance: Charles Francis Adams (1835-1915), grandson of John Quincy Adams, the Adams Estate, South Lincoln, Massachusetts; Estate sale of Mary Ogden Adams (1843-1934), wife of the late Charles Francis Adams, Metropolitan Storage Warehouse Galleries, Cambridge, Massachusetts, November 12-14, 1935; Sale at American Art Association, Anderson Galleries, New York, New York, January, 23, 1936, lot 61; Property of F. Schnittjer & Son (Art Dealers), New York, sale at auction through Plaza Galleries, Inc., New York, New York, January 20-23, 1943, lot 513; Private collection, New York, thence by descent. 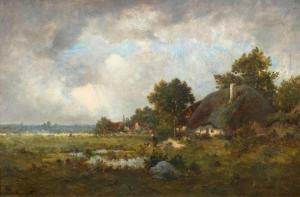 RICHET, LÉON (Solsmes 1847 - 1907 Paris) Landscape with farmstead and pond. Circa 1874/1875. Oil on panel. Signed lower left: Léon Richet. 31.5 x 47 cm. Provenance: European private collection. We are grateful to Michel Rodrigue for confirming the authenticity of the present work on the basis of a photograph. 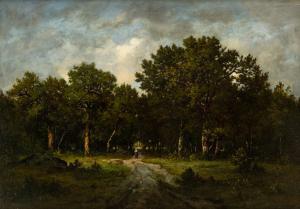 He dated the landscape in the early period of the artist circa 1874/1875. 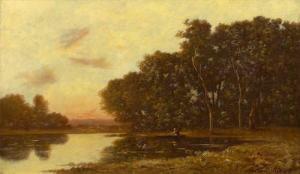 --------------- RICHET, LÉON (Solsmes 1847 - 1907 Paris) Ländliche Landschaft mit Gehöft und Teich. Um 1874/1875. Öl auf Holz. Unten links signiert: Léon Richet. 31,5 x 47 cm. Provenienz: Europäischer Privatbesitz. Michel Rodrigue bestätigt die Eigenhändigkeit des Gemäldes anhand einer Fotografie, wofür wir ihm danken. Er datiert die Landschaft in die frühe Schaffensphase des Künstler um 1874/1875.